Gay of Thrones Is as Good as Game of Thrones...Or Is It Better? We missed our Game of Thrones recap this week (apologies, I was on vacation and won't let anyone else write them — if they even try, I attempt to cut their hand/s off), but don't worry! Funny or Die has got you covered with Gay of Thrones, one of the funniest and succinct recaps on the internet. 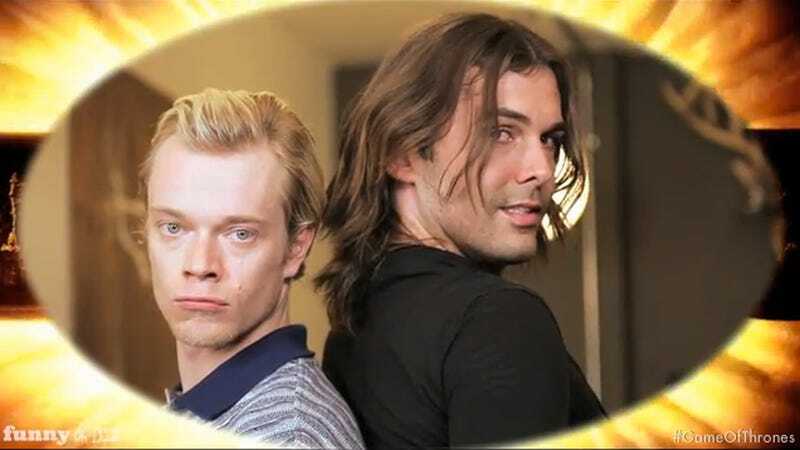 And if you do one thing today, please please please watch the episode featuring Alfie Allen (who plays Theon Greyjoy) as the very blond occupant of Jonathan's salon chair. I love my hairstylist, but, if we're being honest here, I would drop her in a heartbeat if it meant that I got to talk (or be talked at) about Game of Thrones with whoever it was who was fixing my 'do.